Looking to maximize your business exposure with social media? Facebook can be a double-edged sword, even for news and information. With the shutdown of over 20 cannabis related sites, you may need to look somewhere other than Facebook to promote your cannabis-related business. The social media website has been under fire of late for its vaguely-defined regulations on what posts they will allow. Yet, with medical cannabis as a legitimate industry in half the United States, as well as several nations around the world, how can this rule be applied? Pages have been shut down for businesses that advertise sales, discounts, promotions, in stock items, and even new hours of operation for cannabis dispensaries and gun stores. This is increased if a complaint is submitted, regardless of its merit. One business might see its page shut down while a competitor remains online. Businesses in one country might have a page shut down by a complaint from a user on the other side of the world. The shutdowns aren’t just limited to dispensaries either. Even news outlets have been affected. 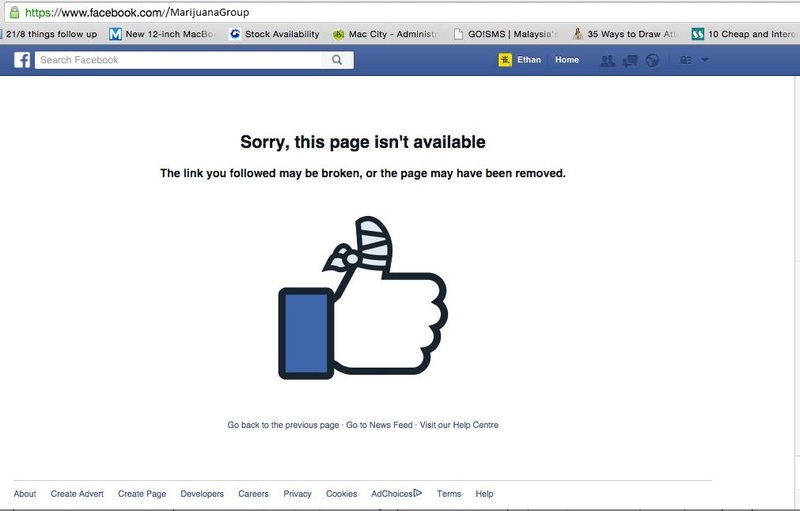 New Republic, a media source with its own Facebook page, recently dealt with a shutdown page after posting an article about the CBD industry. The Ganjier, an organization for professionals interested in marijuana, has also dealt with numerous posts being blocked as far back as December of 2014. The problem may not be in what the post or article is about, but whether the content is promoted with ads that send users to the information. To get the most out of your business presence on Facebook, there are some details you might want to pay attention to, especially if you want to avoid the hassles that others have faced. Use your main image to relay contact details, include pricing or purchasing info, mention or direct site users to “user interface elements” such as Like or Share, or include a call to action. Run any sort of promotion, competition, sweepstakes etc on your Facebook page using Facebook’s features and functionality – ie: make sure you use an app or “custom page” and not “like this update” / “share this photo” / “upload your photo to our page” / “add a comment” (and so on) to enter. Fail to disclose who entrants are giving info to (NOT Facebook). Use Like buttons as a way of voting, or any other feature, such as inviting new fans. Ask people to share your promotion or contest on their personal walls or timelines. These rules apply when promoting a promotion or contest as well. Which means wall posts are also subject. Initially, Facebook welcomed businesses large and small for free, but soon found out the power that its marketing exposure had over its audience. That little Boost Post button on the bottom of your post can have some serious ramifications. A normal post only goes out to about 16% of your friends or likes. If you want bigger exposure, you will have to pay for every post, and the costs are determined by what region you want to target and how many people you want to reach. Be careful not only in what you say but how you say it. Ensure to thoroughly read and adhere to all policies, whether they are comprehensible or not. However, keep in mind this alone may not keep you out of any conflict. The biggest reason that pages get shut down is complaints. These don’t have to be logical, rational, or legitimate. Competitors can use them to eliminate competition, or anyone who finds what you promote, advertise, sell, or even discuss can simply lodge a complaint to make your online presence disappear, and Facebook does not have to tell you why it happened. If you find yourself the subject of this type of censorship, fight it the best you can. Page shutdowns have been overturned on numerous occasions, it is all a matter of justification. The best way to avoid this type of shutdown is to ensure you only focus on those who want to read your content, keep your business page free of offensive posts and even comments on posts, and above all, avoid political or socially divisive opinion. Pages have been shut down over commentary related to gender-neutral bathroom issues. Don’t let the little things get in the way of your business goals. Do you have a page that has had to fight a Facebook shutdown? Tell us about your business and what the effect was on it on social media (carefully) or in the comments section below.